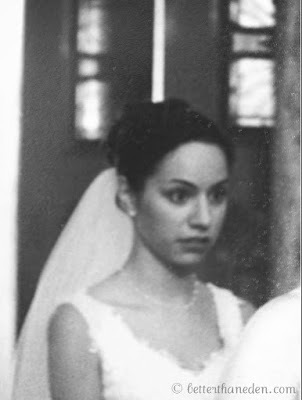 I promise you that the wild look in my eyes was the result of a limo driver who got me to my own wedding twenty minutes late while people were waiting in a ninety degree church. I barely had time to breathe. It wasn't because I was ready to bolt. Maybe me from 12 years ago actually knew deep down that I was about to do the scariest, stupidest thing a human being could ever do. To give myself - this flawed, broken, wounded self - to another human being, as flawed, broken, and wounded as myself - if not more so. To allow myself the possibility of being hurt beyond anything I could imagine. It's insanity. Maybe it's better that I didn't have a chance to second guess any of this. Maybe it was grace that my confidence that this was exactly the man I was supposed to marry did not waver that day. There wasn't even an inkling right at that moment of what our marriage would entail. Bolting would have made sense. I've had this on my heart for a few months now but haven't been able to find the words that fit. But I'll just fumble my way through and hope it makes sense, I suppose. I have had this feeling like there are people or maybe just a person out there who needs to know that they are not alone. It's a beautiful thing when people share the wonderful things about their marriage, especially in the Christian blogosphere. It's needed and it's important. Please keep sharing the beauty of your marriage. We need that. 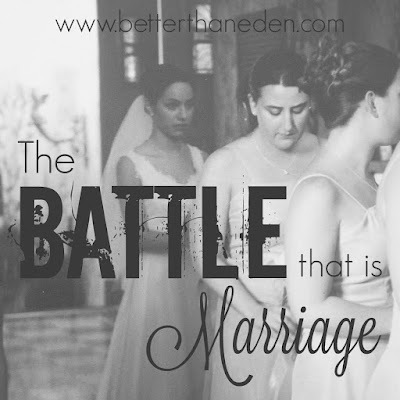 But it can be hard to read that when you are in the midst of a real fight for your marriage. When you feel like you will never ever have that. When it seems like that soul's longing will never be filled in this life. Or even when we've just surrendered to mediocrity. People don't often share the hard parts, and understandably so. So let me share something: Brian and I have struggled. A lot. Like crazy real struggle. Not the "marriage is so tough, he left the seat up again and never thanks me for making dinner" type of struggle. Real stuff. Ugly stuff. I have this sense that there are people reading who are hurting deeply. Who are struggling hard in their marriages and who feel afraid, lost, alone, broken, and hopeless. There are those for whom marriage seems to come easy. Perhaps they entered with less wounds, were better prepared, or just got a better break. Then there are those of us who feel like we are making it up as we go along. Those of us who have been hurt. Those of us who have at some points lost hope. Those of us who have considered giving up. I can't speak to your specific situation but I do know this in the deepest part of my soul: Our God is a God of redemption. A God of hope. A God who delights in redeeming us from the ugliest of situations and lives to pull us out of the muck of our sinfulness. He is a God who laughs in the face of pop psychology and He is a God that insists our life depends upon us following Him to a crucifixion. He is a God who was whipped, beaten, and torn apart to save His beloved from death. This is the God that wants to fight for you and for your spouse and invites you to enter the battle. A battle that when won, is more glorious than anything we could imagine. I want you to know that where you are right now does not have to be the end of your story. And I need you to know that the fight is worth it. I don't know if I will ever have the words to share Brian's and my story, or if I ever even should. But I know our story is a story of redemption. It is a story of a God who made us for a life of beauty and passion and true love. Who called us to a battle that was soul-deep, a battle that is still not over and is being used for our own sanctification. That name up there at the top of this page is my tribute to that reality. It reflects my belief, sometimes willed with all my might, that the only thing better than perfection is redemption. The best fairy tales involve a dragon and a war that must be won. They involve battle scars and a Love that will not give up even if it must sacrifice its very Self. God can use the pain, the battle, the struggle, the stripping away of what we thought marriage would be for our own healing and to help us become more fully the men and women He created us to be. He asks for two people to become one so that He can make us better than we ever would have been without that person. He asks us to let go of everything that we thought it would be so that He can replace it with something beyond our wildest dreams. I see Him doing that with us. Nope, you are not alone. There are others fighting the battle, too, and there is a God who longs to give you the victory. You may be considered a fool by the world to hope for that kind of love or for even engaging in the battle but it is real and I'm here to tell you it is worth it. Keep fighting. Hmmm. I posted, then it disappeared. I wrote one thing and was writing another. 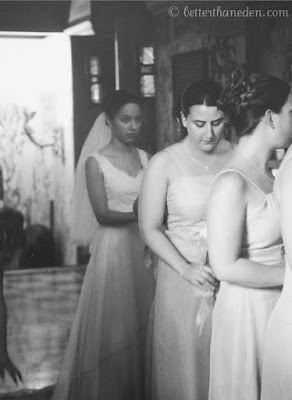 I wrote that still to this day, your wedding was the most beautiful weddings I have ever attended. Everything about it was perfect. And that picture is HILARIOUS! haha. oh my goodness mary, that first picture of you is priceless! and i love seeing these little snippets from your wedding! marriage is rough sometimes (biggest understatement ever) but you both work so hard and so diligently at it...with your relationship, with your faith, with your boys, with homeschooling. i know its not perfect but again, God doesn't ask for perfection but for your faithfulness. i think you have definitely got that. you are committed to your vocation and i see you both trying your best...and maybe given your circumstances, you have to, but what an awesome gift that has turned out to be. to have to engage, be truly present, reflecting on your wounds and trying to transform them together. most people never live that fully in their marriage or family life. i think the hard times can really reveal to us what matters most. and our trials end up becoming a clear path for healing and redemption, if we so choose it. and you both have. the healing and transformation will continue throughout your lives, but so will their fruits. so much to look forward to! Thank you Mary... Thank you for makin me cry, for giving me peace and for giving me hope! Your words are so beautiful and I love you! That should say 'give' not 'five'! This is really beautiful, Mary! I'm sure there are a lot of us that can relate - I certainly can! One of my favorite things about clicking over to your blog is that you're so encouraging and honest, and let me tell you, those are two things I value so much in a person! I have had my own share of struggles and I know they are by no means over. But God has brought us through some big ones and every time we come to a mountain and are weary just looking at it, God is faithful when we turn to Him. Learning redemption and forgiveness on such a personal level (as in a marriage) has taught me things I would not trade in for an easier path. And lastly, thank you for posting on marriage! I don't know if there are more women out there like me who love all of these wonderful bloggers but aren't quite at their child-bearing years (even when we wish we were) yet, but still need encouragement for their marriage. There's so many fantastic takes on motherhood (which I seem to store away for when I'm a mother) but I always get excited to read about marriage since that is where I'm at right now. Praying for you and Brian! Keep fighting the good fight for your marriage! Mary, this is such a beautiful post! I love the honesty, and the total reliance on a God who does not promise easy, but gives us His cross and resurrection as hope that all may be made new. Last weekend, I was speaking to a good friend from Steubenville. We were talking about marriage. And, I shared with her how I have had a hard time relating to those who say marriage is hard. Pete and I have been blessed. But, I think it is especially because God knew my weaknesses that our marriage has been "easy (or should I say not as difficult as I expected)." Both Pete and I were older when we got married. And God did a mighty work in me the years before I met Pete and even while Pete and I were dating. And I think He had to. I often think that my married life would have been disastrous if I had gotten married right out of college. I was wounded and hurting and needed so much growth. 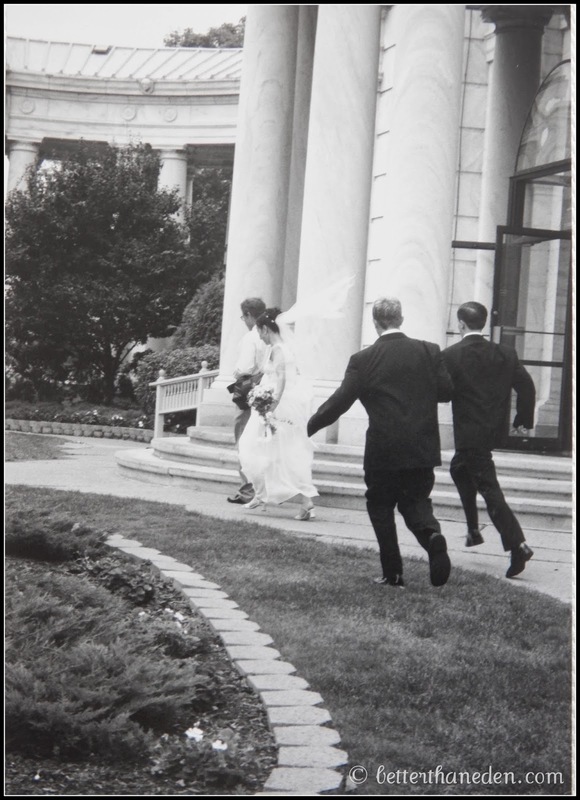 I would have run when things got tough in marriage, I have no doubt. God blessed me with that time before marriage so I would be in the place, when I got married, that I would not run when things got tough. I think the struggles, the cross, are a testament to your faith and total reliance on Him. Keep fighting the good fight Mary! Praying for you both! Thank you for sharing this. Perfect Chesterton quote to sneak in there! And you're right about being able to find and give support within the Christian blogosphere. This is a wonderful quote and thank you for sharing your experience. I love how Chesterton calls it a duel and then says it shouldn't be declined -- I find myself easily falling into the mindset that we should avoid hard things and look for comfort, but there are battles that we absolutely must face and fight! Maybe part of our culture's problem is that very mindset -- it seems easier to just give up than to keep on going with the fight, and why wouldn't we do that? But Chesterton (although he describes himself as the laziest man he knows) gives us this call to arms and reminder that we have to keep fighting. What a wonderful post, and thank you for the encouragement. And what a perfect Chesterton quote for it! Refreshing to hear an honest voice which is also gracious and hopeful. Well done. This is so beautiful and honest and transparent...thank you for sharing. Marriages have been on my heart since I met your brother...I thank God for giving Kevin and I strong marriage despite what happened with our own parents - all around the time we met, dated and married. I remember getting married and being so unsure of staying married. I wanted a guarantee, but there is none. I think it's a good reminder that no marriage is too strong to pray for protection. Praying for all the marriages in our family today. I'm honored to call you my sister-in-law! Gosh, Mary, this is so full of wisdom. Ultimately all the circumstances of our lives demand that we know who God is.He alone is the rock. We can not lean on our great parenting techniques or our deep love for a spouse or own virtue. Beautiful post Mary! Thankyou for posting. My husband and I are in the same marriage boat as you. Or have the same model anyways. You know, the boat that some days sails in tranquil waters of the tropics and other days a hurricane we didn't think we'd survive. But by the grace of God we are still together. It is a definite dying to oneself in a marriage. I like to think sometimes about what christopher west said. To love someone is to see them as "unrepeatable". That is, someone else will always be beautifull er, smarter, and more intelligent than you or your spouse. But love knows the individual and loves the unrepeatable qualities. My husband is unrepeatable. I especially see that thru the eyes of my children. I see that when my daughter ask questions and is slightly depressed for her friend who is split between divorced parents. I see it when he makes breakfast for the kids or changes my sons diaper without a word from me. I do NOT see it when the devil gets to me. We all must pray for marriages! We can be so blind in our anger. We must be slow to anger and rich in compassion too! No, Mary, you are most definitely not alone in experiencing the difficulties of marriage and married life. Stresses like job losses, illnesses, births, in-law issues (or in my case, my own parents), health issues that put the conjugal act on hiatus for awhile, financial crises, moves, deaths in the family,... yes, on their own individually each of these could be a deal-breaker for some couples. Yet Chris and I, with God's sacramental grace, have managed through these several times over; I'm not sure how, really, other than by dedication to the person we chose to walk with through life, that person who'd help to refine and sanctify the other. It's not a victory or evidence of a successful marriage, but rather, like your story, it's a testament to "die hard" love, to two people fighting for all the work they've put into a relationship, to remaining receptive to God's will for us, knowing that our children need us to put forth every effort to work on our marriage for their security and an earthly example of God's love for them. So, thank you. Thank you for being vulnerable to the blogosphere, for being candid in your writing about your own marriage, and for showing the beauty in fighting the good fight. You are quite an edifying example of a Christian woman. Miss you, friend. Thank you for sharing your heart & soul in such a profound way. The message is so very important and you have such a gift to proclaim it so beautifully. I'm so proud of you and the awesome Christian woman you are. 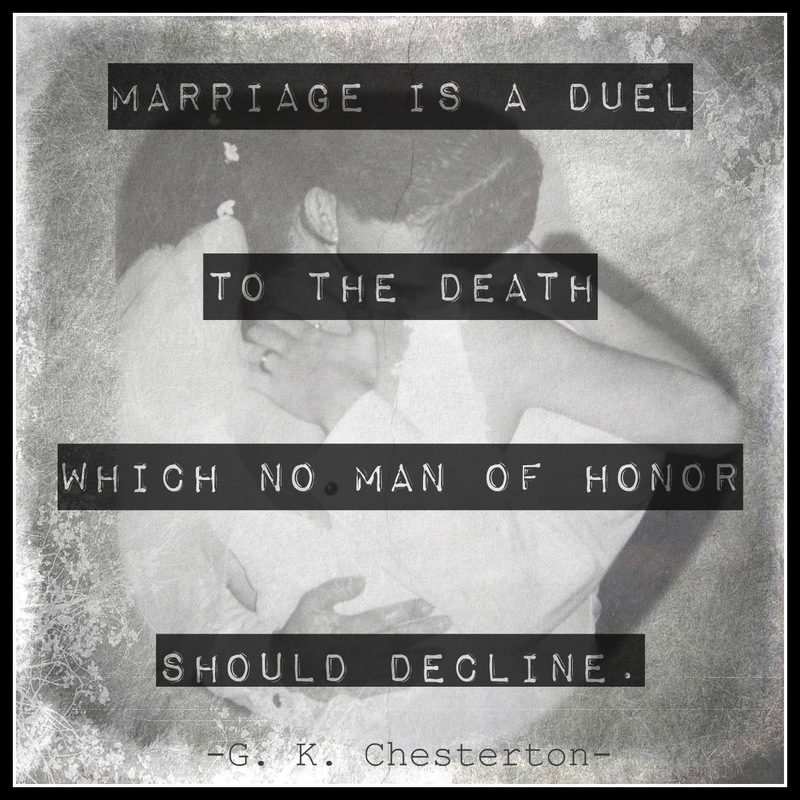 Because marriage is about Christ and His church, the devil wants to destroy it. You can bet he is working at all of us, trying to whittle away at the testimony God wants to have in us by our marriages. BUT "greater is He that is in you [us] than he that is in the world," and the continuation of our marriages is a miracle wrought by the grace of God manifested in a thousand thousand ways. Thank you, Lord! And thank you to every one of you who participates with God's grace with whatever small or large thing you do, even a small bit of trying a little harder - I REALLY appreciate you! This is a beautiful post that is full of truth. Thank you for being so open and honest. Chris and I have had our struggles. Deep, hard struggles that made healing feel like an impossibility. Thanks to prayer and counseling we are still together and happier than we could have imagined. Your honesty and transparency, like always, are so encouraging. I would bet that a good many of us- even those who only share the beautiful parts publicly- can relate. Thank you for your heart. I just love coming here. The pictures - priceless! Your vulnerability, heart, and bravery - beautiful! Thank you for sharing what has been on your heart. Prayers for you all in the good times and bad! I think my husband and I had our major trials in our younger years when we first dated. It was tough. Prayerfully, I hope to share that on the blog at some point. Since we've been married a mere 4 years, I know that we have many more good times and bad ahead, which makes me so thankful for the sacramental graces from our marriage! This is a beautiful post! Thank you for being so open about the crosses that can come from our marriages. I, too, have had many deep hurts in my own marriage and have also wondered if we would make it at times. Looking around and wondering if I was alone in my suffering, this post assures me that I am not. This community of moms who blogs and supports one another is blessed by your honesty. May God continue his healing work in your marriage so you can be a witness. I like the line "That the best fairy tales involve a dragon and a war that must be won." I don't like the "and they all lived happily ever after." Instead I would say "and they went on stronger and more prepared to meet future dragons." You two have done an amazing job facing your dragons. Happy Anniversary!!! May your future dragons be tiny and may your wars be about toilet seats. Well, I'm glad you did now! Thank you, Christie. That means so much. Mary, thank you for being so REAL! Love to read your posts, and to know I'm not the only "weirdo" who isn't running to a lawyer to file divorce when the cross appears in my marriage. I sure wish this content was in Spanish for so many women who would benefit from the way God speaks through you. I'd love to translate if you're ever interested. Christ IS Risen! Mary with great difficulty I got your book made for this and it was a wonderful last minute companion for my pregnancy. My baby was born exactly a month ago and the encouragement I got from your book was life saving. Never read a book with a Catholic perspective to birth before and I devoured every chapter. I was really happy to read your blog and never in my wildest of dreams expected this post. Timely. Thank you once again.